After a fair amount of hype and even more leaks, Samsung’s Galaxy A9 finally got announced today in Malaysia. 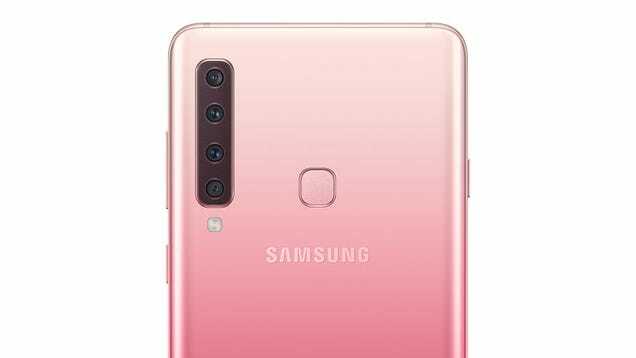 While it’s unclear if the Galaxy A9 will ever see an official release stateside, Samsung’s world-first phone with four rear cams could be a preview of what’s to come on the Galaxy S10 next year. Featuring a surprisingly high-res 24-MP camera in front, and four cams in back, the A9 has two more cameras than even Samsung’s 1,000 Galaxy Note 9. And while some folks may say the A9's 5-MP depth sensor doesn’t fully count since it can’t actually take photos on its own, that still leaves the phone with a 24-MP main camera, a 10-MP telephoto cam with a 2x zoom, and an 8-MP ultra-wide cam with a 120-degree field of view. The proliferation of camera sensors on phones is something that has been speeding up lately with Huawei and more recently LG offering three rear cameras on the P20 Pro and LG V40. But more importantly for Samsung fans is that the Galaxy A9 hints at what Samsung is working on behind the scenes. Samsung has a history of releasing devices in the fall that often seem like regular consumer products, but are also partly demos for new tech or manufacturing processes. This happened when Samsung released the Galaxy Alpha in September 2014, which featured a new chamfered aluminum frame that was a big improvement in both strength and looks over the previous Galaxy S5. Then just two months later, Samsung released the Galaxy Note Edge in November 2014 featuring the world’s first functionally curved display. And then wouldn’t you know it, in early 2015, Samsung released the Galaxy S6 sporting a chamfered aluminum frame, and on the Galaxy S6 Edge, a screen with rounded edges on both sides of the device instead of just one like on the Galaxy Note Edge. This doesn’t mean it’s a guarantee that Samsung will offer a similar camera setup on the Galaxy S10, but it’s clear the company is toying with the idea. And with Samsung also on deck to show off a bendable phone before the end of the year, there could be some big changes in store for mobile gadget conference MWC 2019. Either way, amid the rise of all-screen phones, the promise of flexible displays, and the swift increase of the number of cameras getting crammed into phones, we may see a whole new generation of radically different handsets within the next 12 months.